The “blue stuff” is the fastest working natural treatment! It will quickly reduce ammonia and bind-up any phosphate. Two problems every pond can have!! In addition, it breaks down ammonia to nitrites and then nitrates. So, it slowly eliminates ammonia, nitrites and nitrates. 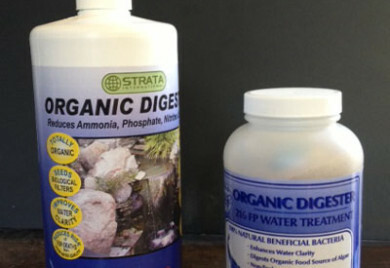 Nitrites are very dangerous for fish and nitrates are used as a food source for unsightly growth in the water. 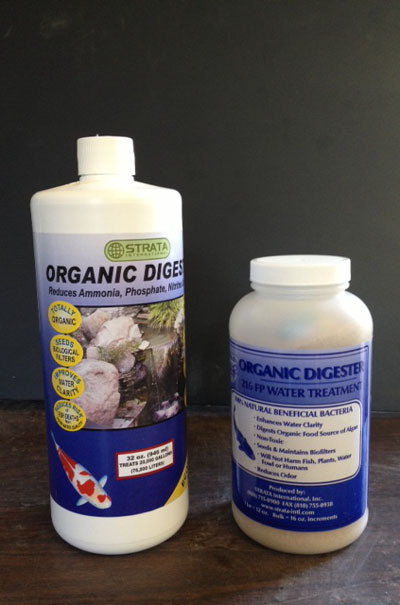 Organic Digester natural pond treatment will also reduce bottom sludge and seed your bio-filter! Organic Digester also works quickly to reduce odor and sludge in ponds and tanks containing those lovable, but mess-making Turtles! Also acts quickly in Pondless Waterfalls, Birdbaths, as well as Fountains! In addition, Organic Digester has been very impressive in Aquaponics treatments!! This fast acting process ensures that the System will keep on working long after most products have failed. With a simple maintenance dosage of the product in direct ratio to newly added waste, the System controls the organics long term and degrades and reduces the waste and sludge itself. “Maintenance Basis” means once the initial few treatments are done and the pond has obtained a decent water quality, clarity and consistency. Simply mix the powder with pond water in a bucket and then immediately apply to the pond. No hydration is necessary. This product cannot be overdosed! Use as much as you would like. Although it has a shorter shelf life than our powder, (12 months as compared to 3 years), due to the shorter lag-phase, it reacts more quickly in remediating the environmental waste. Because of the diminished lag-phase, the microbes immediately begin to degrade the waste, reproduce and quickly increase the number of CFU’s. This aids in further speeding the process. The liquid is the most concentrated on the market. Organic Digester is cultured in our factory, not in the bottle. There is no quality control when a product is cultured in the bottle. Most ponds should be treated weekly during the warm weather months. Always retreat after a rain! Rain will produce phosphate in the water!